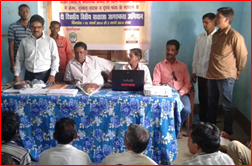 In 2015-16, Gram Sathi successfully organized “Financial Literacy Awareness Program” with the support of NABARD. Under the program, 30 Gram Panchayats of the Chandan and Katoria blocks in Banka district in Bihar and 31 Gram Panchayats of the Poreyahat block in Godda district in Jharkhand were comprehensively covered. People of these three blocks were well sensitized on the issue concerned through street plays, audio-visual aids and meetings. Through this program, the beneficiaries were informed about the financial system of banks, its components and functions, need and the benefits of being associated with the banks by having saving accounts, deposit accounts or other government schemes with banks. Awareness was also spread on Central Government’s flagship financial schemes, such as the Prime Minister Jan Dhan Yojana, Prime Minister Jeevan Jyothi Bima Yojana, Prime Minister Suraksha Bima Yojana and Atal Pension Yojana besides other credit-linked schemes. Discussion was also made on importance of having a bank account, advantages of saving with banks, benefits of borrowing from banks and linkage with bank schemes. Mr. Devananad Kumar, Trustee, Gram Sathi took the opportunity and informed the gathering about the concept of Self Help Groups and its unique approach to address poverty. 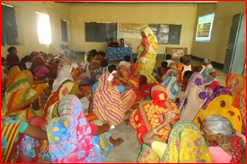 The program spread a good awareness among the people and as a result, a total of 3645 people were linked with Banks in Katoria and Chandan blocks in Banka districts in Bihar and 3162 people were linked with Banks in Poreyahat block in Godda district in Jharkhand.